There’s something a little different about the red and grey 32-story apartment building in Brooklyn overlooking Barclays Center. The bright modern residencies at 461 Dean weren’t constructed where we see the shining building today; they were constructed in a factory, transported to the site, and assembled. The building is the world’s tallest modular tower . Modular housing is also popping up in other parts of the country. Google reportedly spent $30 million for 300 modular homes in the San Francisco Bay area, and Microsoft is reportedly spending $0.5 billion for modular housing in the Seattle area. While modular construction—in which structures are created offsite in manufacturing facilities and transported and assembled later—makes up only a small minority of today’s construction, it is gaining notice as a potential solution to today’s housing shortage and high housing and construction costs. Despite some experimentation in the past, including a development by famous architect Frank Lloyd Wright, modular housing makes up just 2 percent of single-family home construction and 3 percent of multifamily construction today, according to an article  in the National Review . 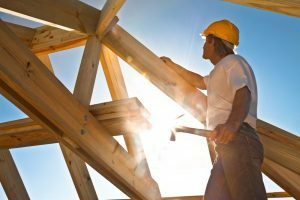 Looking ahead , the National Association of Home Builders  expects construction to remain flat this year. Modular housing could help reduce construction time by half and construction costs by 10 to 20 percent. Instead of the nearly 22 separate types of professionals that contribute to traditional home construction, a smaller force of workers can build housing in a climate-controlled facility. “As housing prices grow farther out of reach for millions of Americans, the smaller budgets and faster building times of modular housing could be an affordability game-changer,” Hendrix stated in his article. However, modular construction companies face several challenges in creating and distributing their buildings. Unionized labor forces have not embraced modular housing construction. Acquiring the large upfront funds from lenders can be a challenge as well. The natural ebbs and flows of the real estate market can also be challenging for modular housing companies, which need continuity in demand to prosper. Another major challenge comes in the form of regulations. Across the country, there are about 93,000 different building codes, which vary by city and county, according to the National Review. Inspections for permits may need to take place in the manufacturing facility, which may be far from the city where the building will ultimately be located.